Pakistan is one of the blessed countries which have everything that nature could give. From sea coast to fertile plains to snow covered mountains, gushing rivers and beautiful vast stretched prairies – its landscape changes every few hundred kilometers. While going down south from the province of Punjab into the Sind province, the lush green landscape gradually start to change colour, texture and foliage. From lush green plains, the soil becomes sandy and then nothing but vast stretches of desert. The lower portion of Pakistan stretched from Baluchistan to the Indian border 9and even beyond) is nothing but desert. And it may amaze many when they would know that we have sand patches as high as in the foothills around snow covered mountains of Skardu. There are three major deserts in Pakistan, namely the Thar, Cholistan and the Kharan deserts. 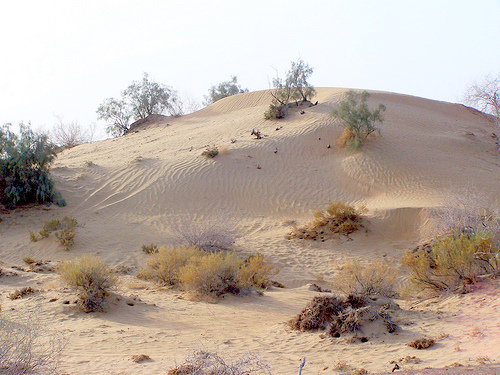 The Thar desert falls in the category of Monsoon deserts. The Thar and the Rajasatn desert (across the Indian border) is the largest, spread over some 446,000 square kilometers. The Thar is largely unpopulated except small towns of Umerkot, Mithi, Mirpurkhas spread over its vastness. More than half a million people, 70 percent of whom are Hindu, live in the desert live in the area. The people live in round mud-walled huts thatched with grass and surrounded with thick thorn hedges. These are clustered round the more reliable wells or along the tops of ridges. The women wear long, full, red or orange skirts and cover their heads with embroidered or tie-dyed shawls. Married women encase their arms in bone or plastic bangles from wrist to shoulder (widows wear bangles above the elbows only; single girls wear them only round the wrist). The Cholistan (locally known as Rohi) starts some 30 kilometres from Bahawalpur in the Southern Punjab of Pakistan and is spread over an area of some 16,000 square kilometres and extends up to the Thar desert in the Sindh province. The word Cholistan is derived from 'Cholna' which means moving. The people of Cholistan lead a semi-nomadic life, moving from one place to another in search of water and fodder for their animals. Drawar Fort is the major landmark of Cholistan Desert. The area was once well watered by the river Ghaggar now called the Hakra in Pakistan and known in Vedic times as the Sarasvati. All along the 500-km of dried up river are over 400 archaeological sites, which date back to the Indus civilization 4500 years ago and are clustered around Drawar Fort. Cholistan has a population of some 100,000 semi-nomads, mostly as camel and goat herders. The nomads belong to many different tribes, though most of them are descended from settlers who came from Baluchistan at least two centuries ago. The women swirl along in full red skirts and embroidered shawls, and the men wear bright coloured turbans on their heads. The Kharan Desert is located in northwest Baluchistan. The desert consists of shifting sand dunes, with heights varying between 15 and 30 meters. The desert is in fact continuation of barren wastes that occupy almost half of Iran. Average annual rainfall throughout these deserts is well under 100 mm. The desert includes areas of inland drainage and dry lakes (hamuns). The Gowd-e Zereh (lake basin) in Iran is separated from Kharan in Pakistan by the low Chaghai hills, which, with the highlands around the extinct volcano Koh-e Tafta'n, cause the Mashkel river to form a lake. The surface of the Hamun-i-Mashkhel, which is some 85 kilometers long and 35 kilometers wide, is littered with sun-cracked clay, oxidized pebbles, salty marshes and crescent-shaped moving sand dunes. The area is known particularly for its constant mirage and sudden severe sand-storms. And a few words about desert up north. One hears of deserts in plains but never at the foothills of 18,000 feet high snow covered mountains. Skardu Valley is one such place which is carpeted in fine ash white sand through which greenish blue in winter; grey as tarnished silver in summer, the Indus snakes lazily between wind-ribbed sand dunes. Pl have a look at this article.